Malaysia is home to magnificent creations of mother nature: some of the oldest in the world lush green rainforests, unique wildlife, and preserved national parks. Thus jungle trekking is definitely a must try for those who are visiting this country (even for a short stopover). These treks are targeted at beginners who want to experience the exhilaration of trekking whilst getting close to nature. So to help you begin planning for your next trek, we’ve compiled 8 of the best easy jungle treks in Malaysia for all of you nature enthusiasts out there who want to soak up Malaysia’s extraordinary nature. Also known as KL Forest Eco-Park, this green park is literally located in the middle of Kuala Lumpur at the base of KL Tower. We recommend entering via the main entrance opposite St. Andrew’s Church. It’s a short walk from Masjid Jamek LRT station – but not so close from Bukit Nanas Monorail stop (I know, we also got confused). Even though it is small in size, this forest reserve has several trails for nature enthusiasts to explore. There are 3 major trails at the forest reserve: Jelutong trail, Penarahan trail and Arboretum trail; plus a short but sturdy canopy walkway able to withstand a horde of energetic children. Immerse yourself in nature at the heart of Kuala Lumpur! “ Urmm… is there a REAL jungle hiking trail closer to Kuala Lumpur?” Of course! Templer’s Park also known as Taman Rimba Templer in Malay is north of Batu Caves, roughly 20km ride from the centre of Kuala Lumpur. This KL jungle trek through the jungle is easy and level and ends at the waterfall great to cool down during a hot day. Enroute to the waterfall, be ready to cross the stream several times and take in the mesmerizing jungle surroundings. This is a perfect place if you just need a dash amount of adventure for the weekend! In the third largest state in Malaysia after Sarawak and Sabah, situated high above the sea level at 1800 meters, Genting Highlands is one of the famous attractions in Central Malaysia. It is not only known for its Genting amusement park and casino, but also for its untouched jungle. If you were to go forest trekking in Genting, be prepared to be honoured to explore one of Malaysia’s oldest rainforests. You’re going to be fascinated by unique insects, vibrant birds, honeyed flowers, and listen to the rejuvenating flows of rivers and waterfalls. One of our favourite jungle trails is the trek to Bunga Buah mountain. The hiking trail starts from Gohtong Jaya, a town in Genting Highlands. This trail goes up to 1430 metres above sea level with only a 500m altitude gain, but it consists of many challenging ups and downs for both amateur and adventure seekers. Bunga Buah Mountain is waiting for you! P.S. Pokok Kelapa documented their climb in pictures here. Covering about 4343 sq km, the national park is home to the oldest rainforest in the world, as a result, it became one of the main tourist attractions in Malaysia. 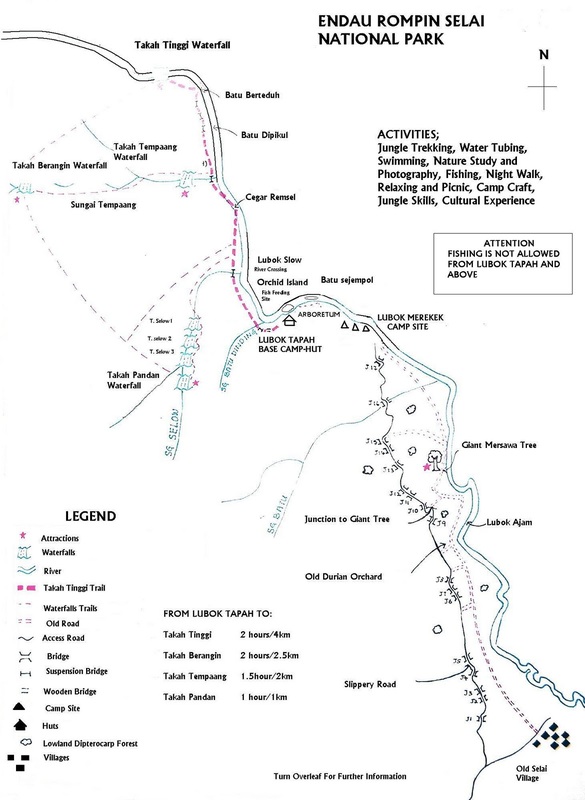 So pack your bags and head to the village of Kuala Tahan which hosts the Taman Negara park headquarters! There are few interesting trails in Taman Negara and we would highly recommend the Teresek Hill trail. The trail starts from Wildlife HQ and it only takes about 30-45 minutes to reach the peak of Teresek Hill. Along the trail, you’ll pass on the best bird watching area and if you’re lucky the White-Rumped Shama will sing as you continue to trek your way up to the peak. Once you reach the peak, you’re going to enjoy the majestic view of Tahan Mountain and luscious rainforest canopy. What we really love about this national park is its world’s longest canopy walkway. Its 530 m long and 40m above the ground level. Initially, it’s built for research purposes but after numerous requests from local and international tourists, it’s been opened to the public. We love this national park, located in the northern part of Penang island because it’s basically a paradise for nature lovers like us. Do you know that there’s a beach in this national park, how awesome is that? There are two main trails in the National Park. One easy route will lead you to Monkey beach perfect for a lazy day on a beach with a fresh coconut. If you’re willing to go through steep climb up of 227m, visit the 14-metre high Muka Head lighthouse that offers a great view of the national park (and its resident eagles) and the cool breeze of Penang. When it’s time to head back, take a boat from the beach back to the entrance for 50RM (per boat). Do you want to avoid the crowds heading to Monkey beach? Turn left for the other route which leads you to beautiful white sandy Kerachut beach, famous nesting spot for turtles. On the way, you’ll pass a beautiful meromictic lake where the layers of water do not intermix. It’s your call. Be immersed into one of the oldest jungle in the WORLD! The famous Ulu Bendul forest is situated at the southern edge of Titiwangsa Mountain area, south of Kuala Lumpur and almost as far as Port Dickson, the infamous weekend resort town popular among KL residents. Estimated to be around 130 million years old, Ulu Bendul jungle offers a lot of activities for its visitors such as jungle trekking, swimming and camping. You can hike Angsi mountain (824m) via its two trails: Putus Hill or Ulu Bendul. Even Though Putus Hill trail is favour by many as an easier route, we would rather go on a little challenging route as you’ll enjoy the luscious flora and gigantic centipede and spiders racing your way up to Angsi Mountain. In short, this is the ideal spot for a tropical jungle escapade which will lead you to amazing waterfalls, inviting rivers, and numerous of rare tropical plants and wildlife! Endau Rompin National Park is the second oldest national park in Peninsular Malaysia that boasts one of world’s oldest rainforests and the 240 million years old volcanic rocks. It’s also home to the endangered Sumatran Rhino – and it’s believed that fewer than 300 of them are left in the world. Usually, most people prefer to visit the Endau Rompin park on an all-inclusive 3D2N tour. However, this national park has so many things to offer and it’ll easily keep you busy for 3-4 days. Waterfalls, lakes, river cruises, rubber tube rafting, night safari and mahseer sanctuary. Children and adults alike will love mahseer that swims around even as you dip your tired feet in the crystal clear water. There are 3 entrances to the Endau-Rompin National Park but it’s more accessible is Selai entry from Bekok town. Arrange a 4WD at Sungai Bantang to the chalets at Lubok Tapah or a camping site at Lubok Merekek. From there you can walk to beautiful Takah Tinggi waterfall (it’s a must! ), Takah Pandan that has more than 50m of straight fall and 2 other waterfalls (check the walking map). Whereas the park headquarters are located on the east side of the park: from Kahang drive west for around 60km to Orang Asli settlement of Kampung Peta. The headquarters offer chalets or beds in a dormitory; you can also rent a tent for 40RM and camp in a designated areas. From there you can start your exploration of the jungle (see the map)! P.S. Wikitravel has a rather elaborate section on the activities in the Kahang entry section of the park. An untouched nature sanctuary in Sabah, Danum Valley is slightly off the beaten path and only a few can boast to have visited it, compared to the crowds that head to Tawau and the diving heaven of Sipadan island. This conservation area is rich with wildlife and green jungle and is best explored through 23km of multiple forest hiking trails around Borneo Rainforest Lodge. Take the Danum Valley canopy walkway or a dip in its waterfalls. With or without a guide you’ll surely enjoy this beautiful luscious jungle where the forest canopy can reach up to 70 meters high! Aside from jungle trekking, you can also try other outdoor activities such as river swimming and animal and bird watching. Maybe you’ll be lucky and spot sun bear, Bornean rhinoceros or spectacled flowerpecker, a bird species only discovered in 2009! Also, don’t miss the Danum Field Research Centre, located in the conservation area, that has grown into one of the leading rainforest research centres in the Southeast Asian region and is located in the vicinity of the 440km2 forest reserve. Its main highlight is the Infapro Project Area, a project for forest rehabilitation, where visitors can learn about forest regeneration and seedling growing techniques. Ready for these awesome jungle treks in Malaysia? We hope this list of Malaysian hiking trails will help you choose where to go next. Have fun and don’t forget to bring plenty of water and some power snacks along! What’s your best hiking place in Malaysia? And If you’re not an adrenaline junky but still want to be close to nature, check out our 5 luxury weekend retreats near KL and 10 waterfalls in Malaysia you’ll love. Mauritius – What To See And Where To Eat Halal?